Manuscript of the ‘Casino Royale’ James Bond Theme by Burt Bacharach. 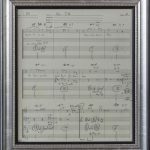 A sketch written in pencil on three systems, each of four staves, with Hal David’s lyrics (‘ . . . Have no fear Bond is Here/He’s Gonna save the world’), headed ‘Main Title/Page 4’. One page, 12-stave paper, framed and glazed, overall size 38.2 x 32.5 cm. in frame. With autograph notes by the scriptwriter Wolf Mankowitz affixed to the back of the frame explaining his connection with the film in 1965–1966 (‘. . . It was a lunatic waste of talent and money and did no-one any good . . .’) and that this manuscript page was given to him by the composers [1965–1966].